Sakai’s first Spring auction is right around the corner and photos of koi that will be offered at this event are now being posted. Click the link below to view the koi that are going to be offered at auction on March 4th. Clients purchasing koi through this auction will have the option of keeping their purchase in Japan, either to be boarded and grown on under the care of Sakai FF or to be entered in any one of a number of upcoming Japanese koi shows. Please call or email for full details. This entry was posted in Uncategorized on February 21, 2015 by koiadmin. 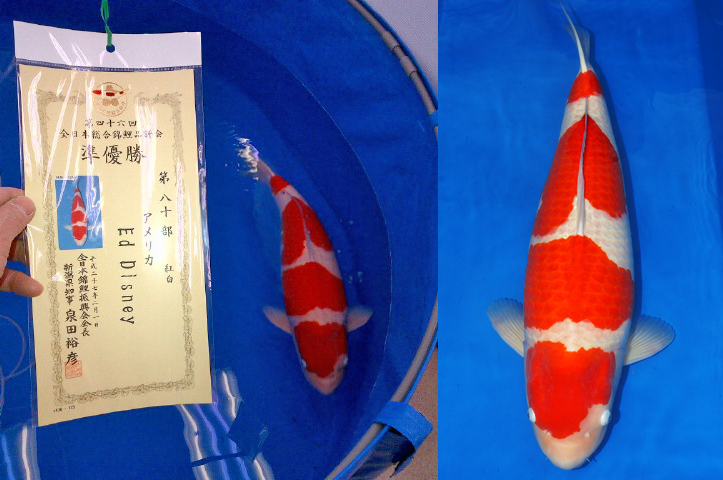 Congratulations to Mr. Ed Disney whose beautiful Sakai Kohaku took home the 80bu Junyusho Award at this years All Japan Combined Koi Show… Arguably one of the most competitive size categories in the show. A fantastic result for her first entry into the Greatest Show on Earth. Way to go Ed! This entry was posted in Uncategorized on February 7, 2015 by koiadmin.